So for the past 2 months David and I have been trying to lower our monthly food bill. We have come up with 3 ways so far. The first is the art form of couponing. We started out trying to find coupons here in PR and on the internet. We discovered most Puerto Ricans do not know what coupons are let alone provide coupons in the Sunday papers. That left us with finding them online. We were able to print many coupons at first but soon realized there is a limit. We combined in-store sales with the coupons we had and our bill was $130, without sales + coupons it would have been almost $200. This first attempt lasted us a month, it blew my mind away that we had food that lasted us a month for only $130! Normally $130 grocery bill would mean what we bought would only last about 2 weeks. We were so excited and the next month tried finding more coupons but our coupon supply was dwindled from the last grocery trip and we couldn’t find any suitable coupons that we needed or we could use. That is how we came up with the following idea: why not ask our friends, family members and our supporters if they would be willing to clip coupons for us if we provided a pre-posted envelope? We sent out e-mails, letters and posted the idea on facebook. A few people came forward and said, “Yeah, sure I can do that!” We received our first “coupon donation” and excitedly sifted through the coupons. We have received 4 “coupon donations” so far and it has helped tremendously! Go figure, right?! We use coupons for everything now, shampoo, dog food and basically any household, grocery or office item you can think of. 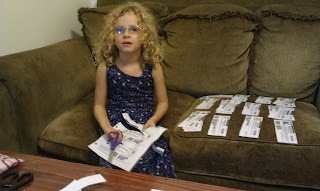 Hannah is even learning what coupons are and how they work. When she see’s candy or her favorite snack food she immediately asks if we have a coupon for that! We have had to retrain how we view in-store sales and how we shop using coupons. Even though PR isn’t as engrossed in couponing as the States, they still have websites where you can view each stores weekly sales circular. So instead of driving around and gathering all the circulars, we can just view them online at home, compare them with the coupons we’ve received, and make out a shopping list. No longer do we hop in the car and arrive at the store couponless and ignorant of sales! The second way we are reducing our food bill is that we have started a vegetable and fruit garden. 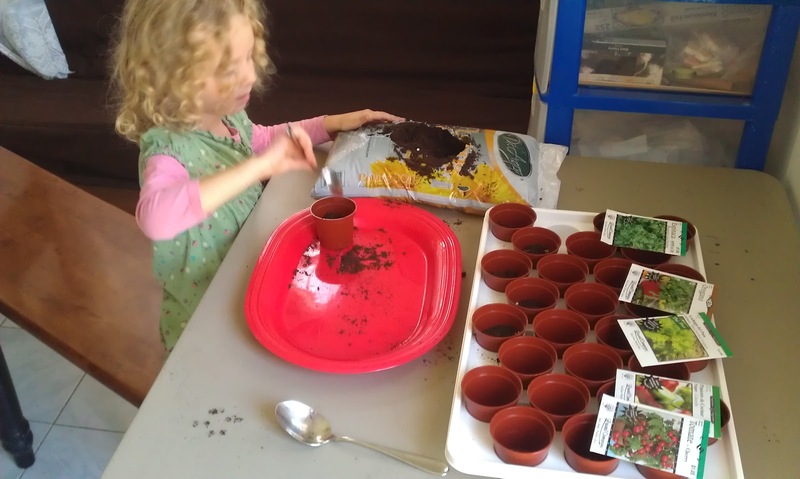 We have taught Hannah to gather seeds, plant them and water them. Hopefully in a few months we’ll have our first crop! We also plan on using the fruits and vegetables to help out anyone who is in need. We don’t have a big yard but we have learned various ways of growing things inside and how to recycle pop bottles as planters for when the seedlings grow out of their indoor pots. We have made a shelf outside that sits on our porch. David is already building another place for when the plants get bigger and start producing food. Hannah is so excited about gathering seeds that every place we visit she is looking at the ground for various seeds; she has gathered Kenipa and palm tree seeds so far. She has said many times that if we take the peanut from her M&M’s and plant the “seed’ we could grow our own chocolate tree! The third way we have come up with goes hand in hand with our food garden. David has been learning and researching about Aquaponics. Basically you raise fish in a tank of any sorts and recycle their water to grow and fertilize your food plants. Through various means of pumps , piping and simple gravity the water starts in the fish tank or tub, gets pumped up a pipe to your plants, the water passes through a sediment bed, watering your plants and the excess goes out another pipe and goes back down to the fish. David is even researching and learning about solar powered pumps so that we won’t be using electricity to run the pump. 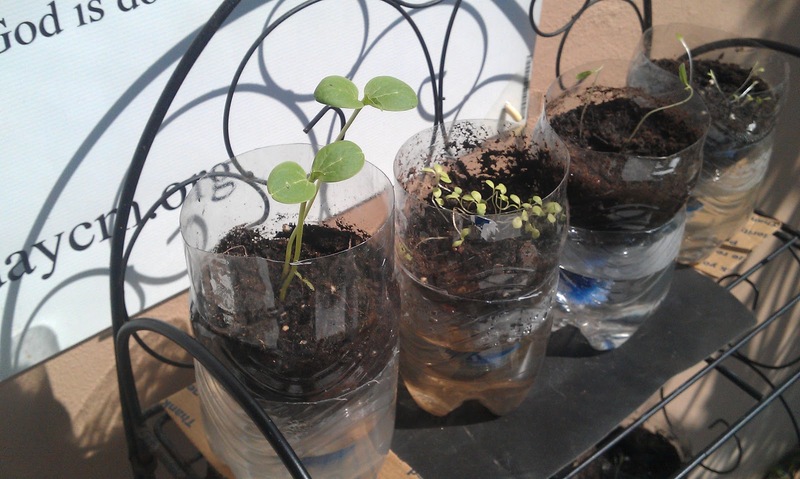 Buying a small solar power system and battery is surprisingly cheap; the cost of the small system is even cheaper than using electric for running this Aquaponic system the first month! Many people just use goldfish or some other small fish in this system but we have discovered that you can use Tilapia. Raising them and caring for them is practically free, you just have to make sure there is enough room in your fish tub. Tilapia are perfect fish for rising in our PR climate, they are resilient to illnesses and produce offspring quickly. Therefore, we will not only be raising a food garden but growing our own Tilapia as well. Now, I am not crazy about fish but as any good mother who wants to set a healthy example, I make a fish dinner at least once a week and Hannah has no problems eating Tilapia. But with this new means of food we’ll be eating fish probably about 2-3 a week along with fresh veggies from our garden! It will take about a 5 months to build, raise the fish to maturity and produce our first harvest before we can take advantage of our work. We have an old swimming pool that has sat outside going unused for about 1 ½ years; we are cleaning it up and getting it ready to accommodate its first aquatic habitants. It is exciting to work, grow and harvest the food that you will be giving to your family for meals on a daily basis. Raising a garden and your own food is something that American culture has almost lost but in other parts of the world it as an every day event that is naturally done and taught to the children along with their ABC’s. I hope that as you have read this article it has encouraged you and maybe even given you some ideas to try to reduce your own family’s food bill. All of this might sound complicated and you might think it takes a lot of time but really anyone is capable with the mind God has given them and the Bible says, “We can do all things through Christ who gives us strength”. If you have any ideas to add, I would love to hear them as would the other people reading this article.